RED AND ORANGE FELT BRACELET FOR SALE, HANDMADE FELT BEADS STRUNG ON ELASTIC WITH VINTAGE BUTTONS IN MATCHING COLOURS. 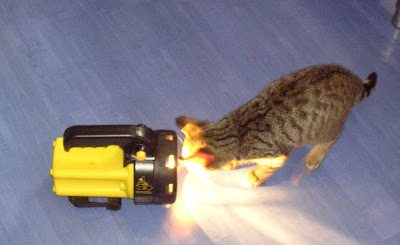 YELLOW TORCH WHICH SPENT 2 1/2 HOURS LIGHTING UP DARK PLACES WHERE DES USUALLY HIDES LAST NIGHT. WE LOST A CAT IN OUR HOUSE, AND SPENT FROM 21:00 TIL 23:30 LOOKING FOR HIM. WE EVENTUALLY FOUND HIM ASLEEP UNDERNEATH A FLOORBOARD UNDERNEATH A 6FOOT HIGH SET OF SHELVES!! 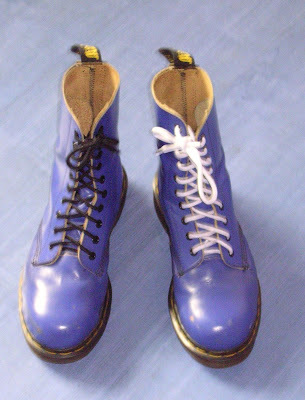 MY "GOOD AS NEW"SIZE 7 BLUE DR. MARTEN'S BOOTS WITH STEEL TOE-CAPS BOUGHT FOR £12.99 IN THE MUSWELL HILL BRANCH OF OXFAM. A VERY GOOD DEAL!! AND FINALLY DES'S LILAC SNAKE! 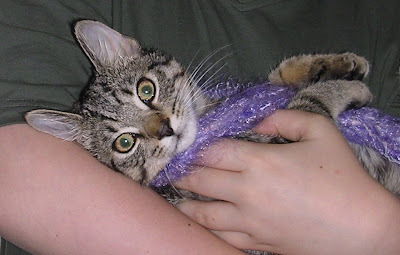 ONE OF MY UNFINISHED FINGERKNITTED SCARVES WHICH IS HIS FAVOURITE TOY!! This is Des, we adopted him yesterday from the RSPCA, he is 4 months old. Then to London where we met up with a most amazing guy, Ben Wilson, aka The Chewing Gum Man. Walking along the street in London, you can see horrid little pieces of dried up chewing gum, that people have chewed, spat out, and then they have been trodden on and dried up. Ben Wilson transforms them into minature pieces of art. They are absolutely fantastic, well painted, each one has a story, and they are dotted everywhere, but untill you have seen the first one, you dont notice them, they are so small and look like small pieces of litter from a distance. After talking to Ben a couple of times, somthing clicked, and I realised that we both grew up in the same area, know alot of the same people, and I remember, 20 or more years ago, walking through our local woods and coming across enormous sculptures made with trunks and branches of trees, also by Ben, he used to create them at night in secret, and then people would have wonderful suprises finding them in the woods, no one knew who had made them, or where they came from. We asked Ben if it was OK to post about him on our blog, and Toby took some pics of the chewing gum art, on his mobile phone, which he will post here sometime soon to show you. We will send you a suprise gift!! please let us know your postal address. Thanks to everyone who joined in, do keep visiting here and leaving your comments! These bracelets are made with long silver plated linked chains, with elastic threaded through the middle, which makes them stretch and fit any size. 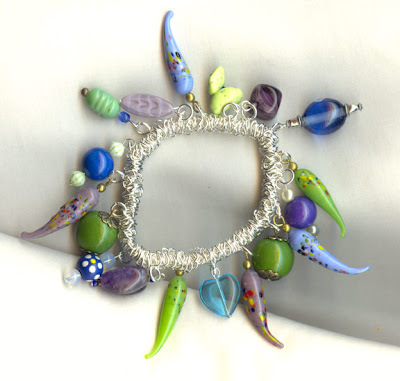 Here are examples of 2 styles, one with little buttons, the other with glass chilli charms and various beads. Also available in gold plated chain. 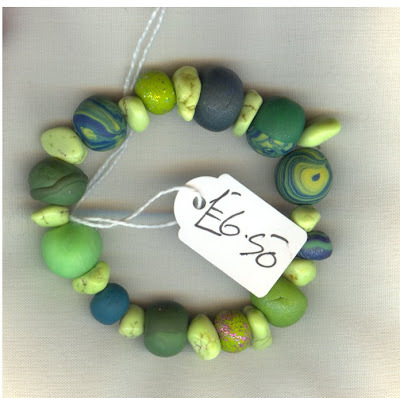 Choose your own colour theme for a bracelet made with buttons or beads, any combination! 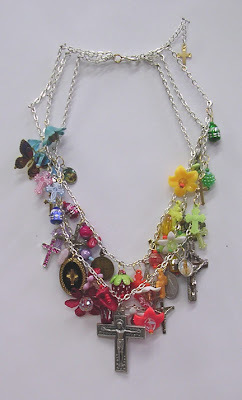 Crosskitsch is a wonderfully crazy necklace created from a collection of vintage charms and crosses, lucite flowers and little beads, strung in rainbow order, on 3 strands of reclaimed chain. It's good to get feedback, what do you think about this necklace? do leave a comment! 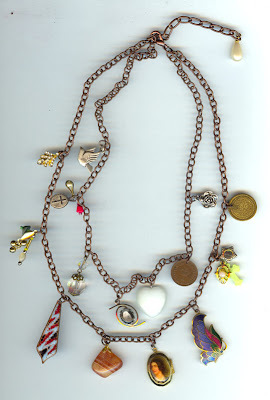 A charming vintage necklace, do you like it? 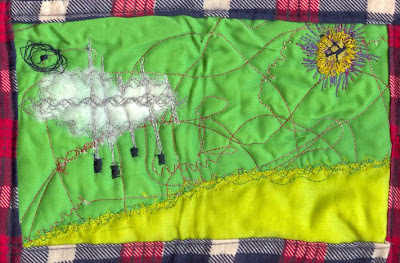 Calling all visitors to this blog, regular friends, lurkers, anyone who sees this message, please join in our celebration. All you have to do, is post a comment here, and leave your name. If you cant do that, email: info@naturalattrill.co.uk and we will add your name to the list for you. A small mystery suprise gift will be sent to the person who has their name pulled out of the hat in a couple of weeks time. Come back and have a look at our blog soon, we will announce the winner here. 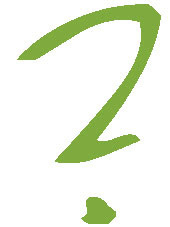 Our last give-away was a donation to charity, this time, to celebrate our 2nd blog birthday, we will send you a present. We'd like to get as many names as possible, a really long list - so please join in, and tell your friends to come and have a go as well - everyone welcome! These are now for sale in Makepiece of Todmorden. 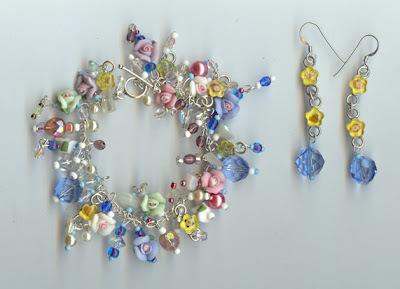 They are made with vintage sterling silver links with little pressed flowers incased in them, vintage glass, gem, and mother of pearl beads, porcelain flowers, and reclaimed seed beads.